UPDATE: Yesterday after we published the building concept of 400 Central Avenue, John Catsimatidis, CEO of the Red Apple Group, spoke to the Tampa Bay Times to provide more details on the development. The concept project below is from New York City architectural firm Hill-West. In a conversation with the Times, Mr. Catsimatidis confirmed that Hill-West did, in fact, come up with plans for 400 Central Avenue. However, he noted that Hill-West was not selected as the final architect. In the case of large projects like 400 Central Avenue, it’s common for developers to hire multiple architectural firms to create concept projects and then choose their favorite concept to move forward. 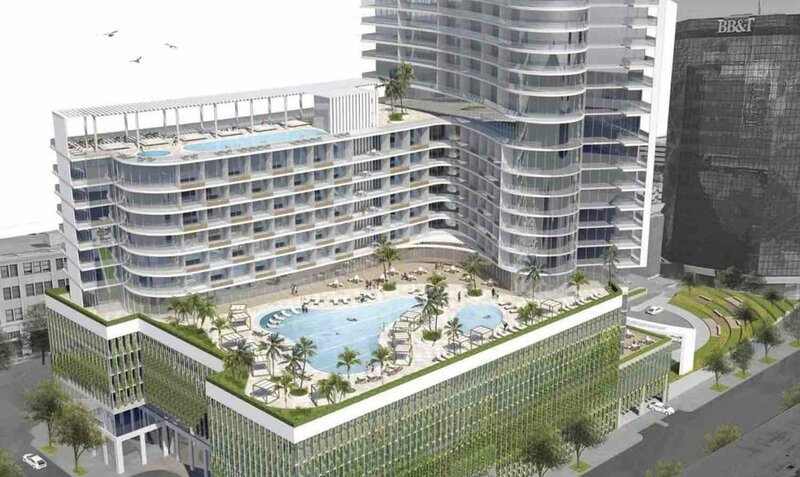 While we don’t know what the winning proposal looks like, Mr. Catsimatidis acknowledged that he will be hiring Miami-based Arquitectonica to design the project. Ultimately, 400 Central Ave will still likely be a condo tower with a hotel component and ground floor retail, but details beyond that have yet to be finalized. 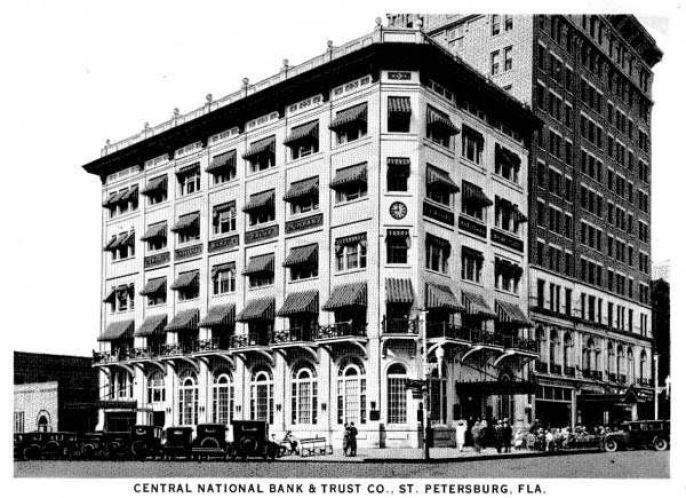 The CENTRAL National Bank and Pheil Hotel in the 1920s. The sale of the 400 Central Avenue block was contingent on clearing the site of the existing buildings, and in August 2016, demolition began on the old Pheil Hotel and parking garage. Once the land was cleared, Mr. Catsimatidis closed the sale in April 2017 for $16.5 million. Since then, the site has been landscaped and fenced as it awaits redevelopment. Finally, we might have a clue. Last week, St. Pete Rising was sent a proposal for the block that outlines a vision for the site. While St. Pete Rising cannot confirm the authenticity of the plans, they appear legitimate and are very detailed. We have not been in contact with anyone from the Red Apple Group or their partners and view these plans as simply a concept for the site since the project is likely still in the early stages of development. With that being said, the preliminary plans reveal a 610 foot, 52-story tower that will feature a hotel, condominiums, and retail. Over 23,000 square feet of retail space is planned for the Central Avenue side of the ground floor, which does not include a 3,600 square foot hotel restaurant located on the west side of the block. An additional 13,000 square feet of retail is located on the 2nd floor. The proposed hotel will occupy six levels (8th through 13th floor) and condo units will fill the top 37 levels (15th through 52nd floor) in addition to a few low-rise condos on levels 3-6. While these plans may not reflect the final version of the project or what the Red Apple Group ultimately proposes, the size and scale of the development cannot be overstated. If these plans, or anything remotely similar, come to fruition, 400 Central Avenue will be the 3rd tallest building in Florida, outside of Miami, and will dwarf St. Pete’s current tallest building, ONE St. Petersburg, by over 150 feet. While we won’t see the completion of 400 Central Ave for several years, it represents the continued rise and renaissance that St. Petersburg has been experiencing for nearly a decade now.